This DVD is a video diary of a birding trip to Australia and Tasmania in the period October 17th - November 4th. Arrangements were by Ribble Bird Tours of Blackpool and the participants were Linda & Roy Harvey, David Hindle, Ann & Graham Johnson, Andrea Jackson and Dave Riley. The tour leader was Stuart Meredith, assisted by Australian guides Barry Davies and Del Richards. The group flew from Manchester to Brisbane, via Dubai and Perth and were then based in Brisbane and Cairns before heading south for a pelagic trip from Wollongong. The holiday was completed with a three day stay on Tasmania, including a visit to Bruny Island. Birds included: Wandering and Shy Albatrosses from a pelagic trip, Satin and Regent Bowerbirds, Brown Noddy, Frigatebirds, Fairy Wrens Honeyeaters, Dotterel, Figbirds etc, plus Duck-billed Platypus and Koala. 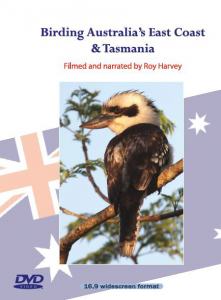 Filmed and narrated by Roy Harvey. Note that this production is in the 16.9 widescreen format. Running time approx. 215 minutes.